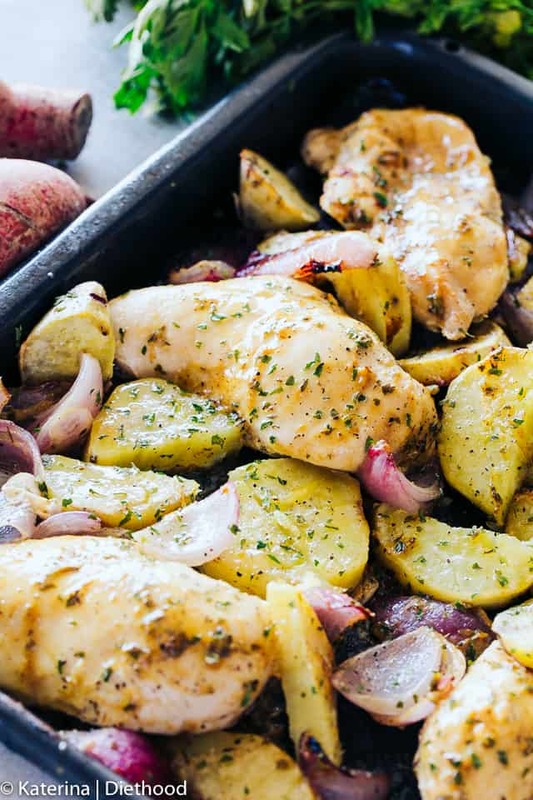 One Pan Roasted Chicken and Potatoes – Quick and easy one pan dinner recipe with chicken coated in a sweet and savory honey mustard sauce and roasted alongside seasoned and incredibly flavorful potatoes and red onions. If Merriam-Webster needed a picture to complete the definition of the word EASY, this recipe for One Pan Roasted Chicken and Potatoes should be IT! Chicken and potatoes and wine, friends! Hi and welcome to my chicken shrine. I got an email the other day from someone telling me that I have too many chicken recipes… HUH?! TOO many? CHICKEN recipes!? Can you really have ENOUGH chicken recipes? Someone please tell me, edumacate me. I can’t wrap my head around it. It’s just so versatile and light and juicy and easy… know whadda mean? Thus, for the umpteenth time, my friends, I’m making you a CHICKEN dinner in 30-35ish minutes. It’s that simple. So easy. So juicy. And it will be on the table pronto. See that amazing honey mustard sauce up there? You’ll want to eat it by the spoonfuls or just spread it on every piece of food that you make from hereon. Kind of like my Maple Mustard Chicken, but not exactly. Here we have dijon mustard, honey, thyme, parsley, and salt & pepper. All whipped up and spread over our chicken breasts. 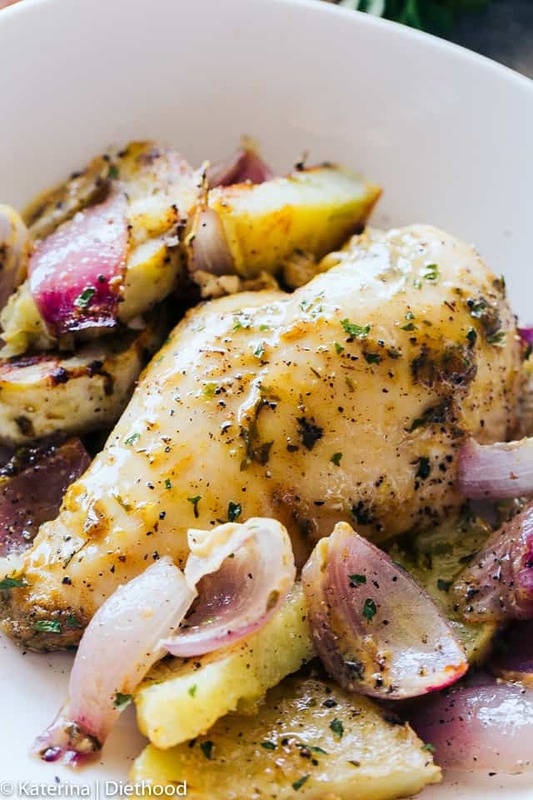 The potatoes and onions are tossed with a bit of olive oil, salt and pepper, and placed right alongside the chicken. 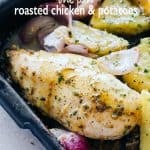 Roasting chicken and veggies on a sheet pan: I have tested this method of cooking on several occasions and the best way to do it, in my opinion, is to preheat the sheet pan. 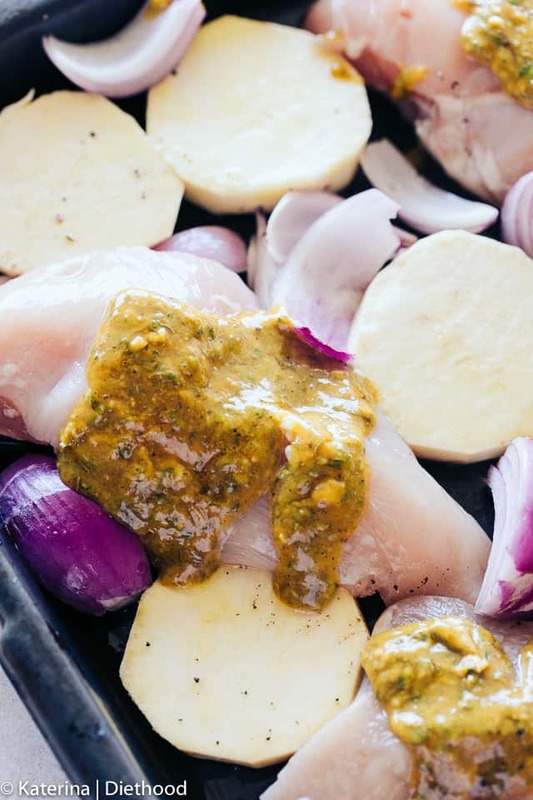 Just pop it in the oven while you’re prepping the food, and when ready to use, take it out of the oven and spread out the food in one single layer. This worked perfectly with my Sheet Pan Chicken Stir Fry recipe and I’m sticking to it. And there’s our roasted chicken and potatoes ready to be devoured. This recipe is BOTH a quick weeknight meal and something that you might feel like you’d have at a fancy dinner party. That’s a one-two punch, friends! 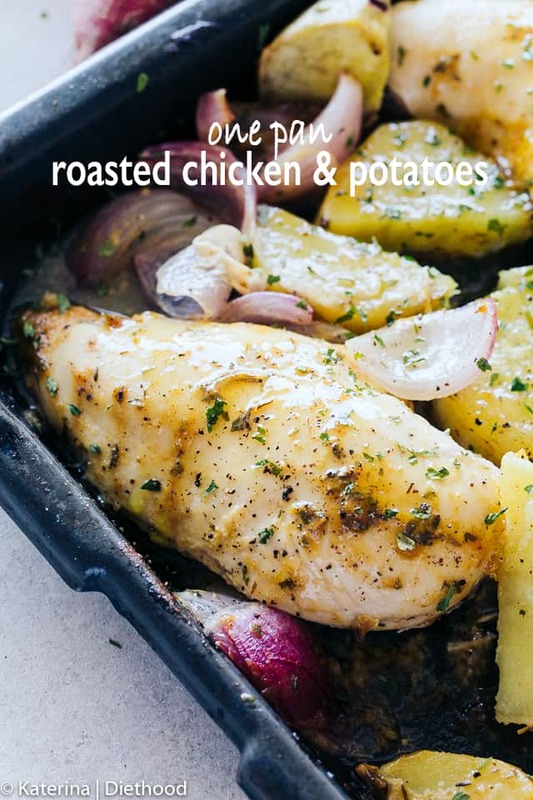 Quick and easy one pan dinner recipe with chicken coated in a sweet and savory honey mustard sauce and roasted alongside seasoned and incredibly flavorful potatoes and red onions. Place a rimmed sheet pan in oven. 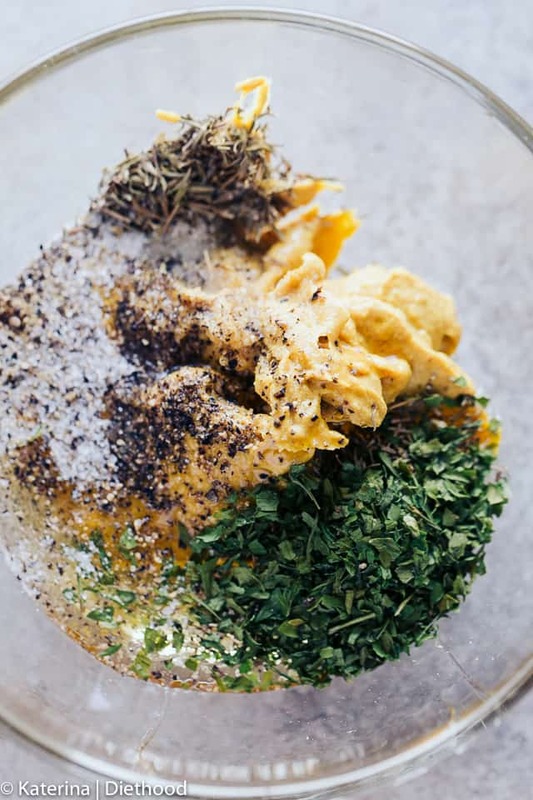 In a small mixing bowl, combine 1 tablespoon olive oil, mustard, honey, thyme, parsley, salt and pepper (to taste); mix until thoroughly combined. Spread the mixture evenly over the chicken; set aside. 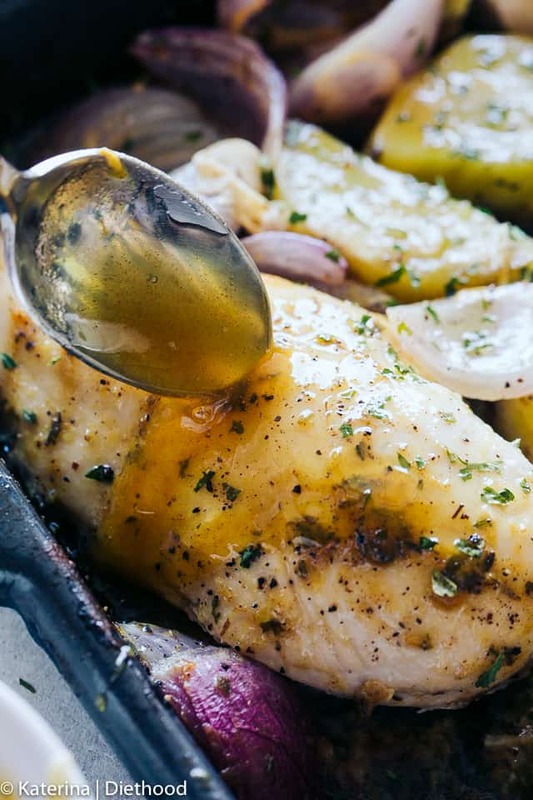 Toss potatoes and onions in a bowl with the remaining extra virgin olive oil, 1/4 teaspoon salt and 1/8 teaspoon fresh ground pepper. Remove sheet pan from the oven. 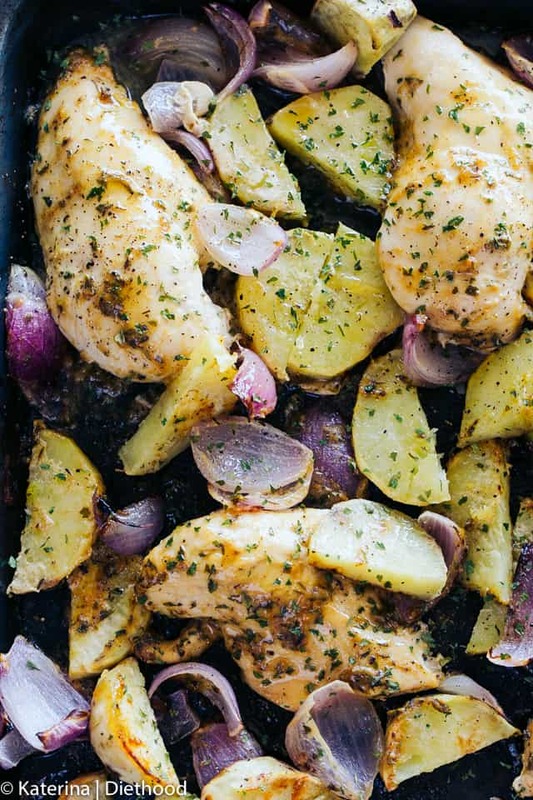 Spread the potatoes, onions, and chicken in a single layer on the sheet pan. Return sheet pan to the oven and roast, stirring the vegetables once halfway through, and cook for about 32 to 35 minutes, or until chicken is done and the vegetables are tender and beginning to brown. Remove from oven; garnish with parsley and serve. OMG! This is an amazing recipe! I can not keep my mouth shut! Slurp! Slurp!Definitely, I am gonna make this at home! Wish me best of luck. Hi! Off the top of my head, I would say use mayonnaise – it won’t taste the same as this recipe was intended, but it’s a fix. 😀 Also, use horseradish if you like. Or maybe mayonnaise and horseradish combined? I hope this helps, somewhat. Would adding carrots change the cooking time? Hi! No, not at all. I’d slice them to about a 1-inch thickness or less.